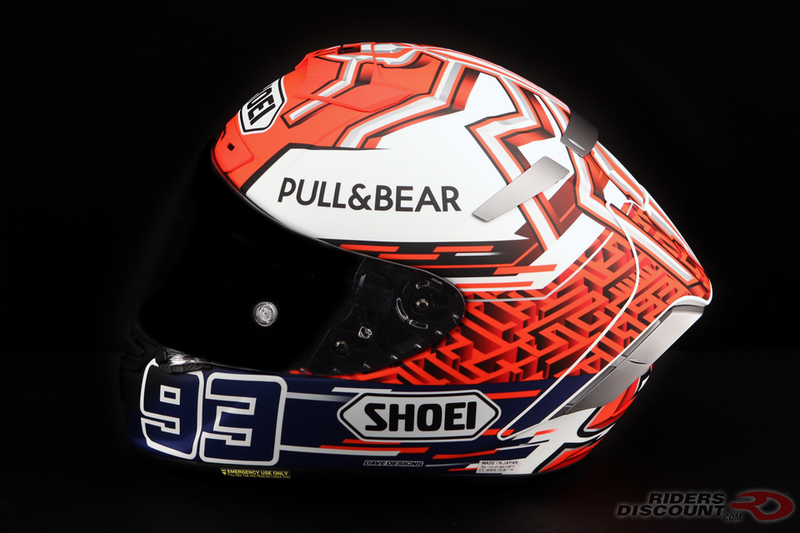 The Shoei X-Fourteen Marquez 5 Helmet has a red, white and blue color scheme, featuring Marquez’s signature ant logo on the top and number 93 on both sides as well as the back. 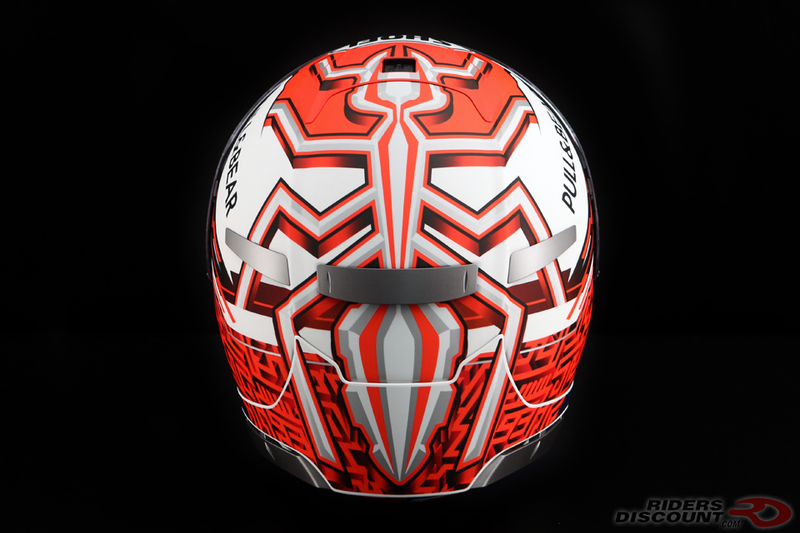 A red and black ‘maze’ pattern wraps around the helmet. The X-Fourteen has several new features that make it even better than the X-Twelve. 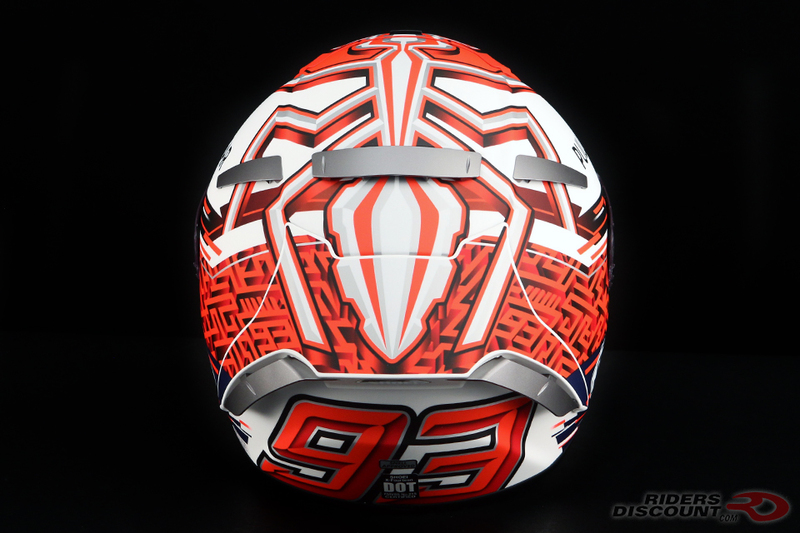 The shell shape has been redesigned to improve the aerodynamics of the helmet, including a brand new, patent-pending Rear Stabilizer. The Rear Stabilizer works to “maximize high-speed stability while reducing negative forces on the rider.” You will experience 50% less buffeting, 10% less drag, and a 3% lift reduction with the X-Fourteen. You can customize the aerodynamics by switching out the standard rear flaps with narrower ones (sold separately). Shoei takes the customization a step further by incorporating an innovative five-stage rotating dial that allows you to fine-tune the shield and base plate. The X-Fourteen’s ventilation system has received several upgrades. 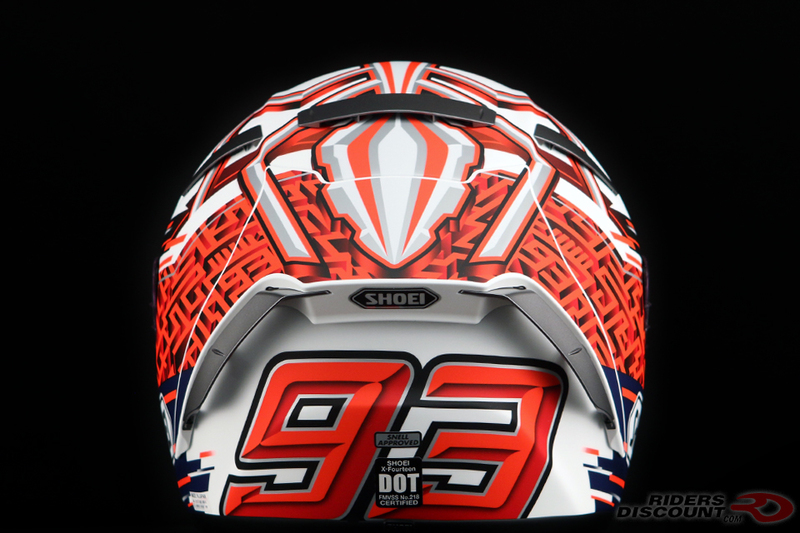 Now the cheek pads have a cooling “tube” that allows fresh air to enter the helmet, cooling the rider’s cheek area. 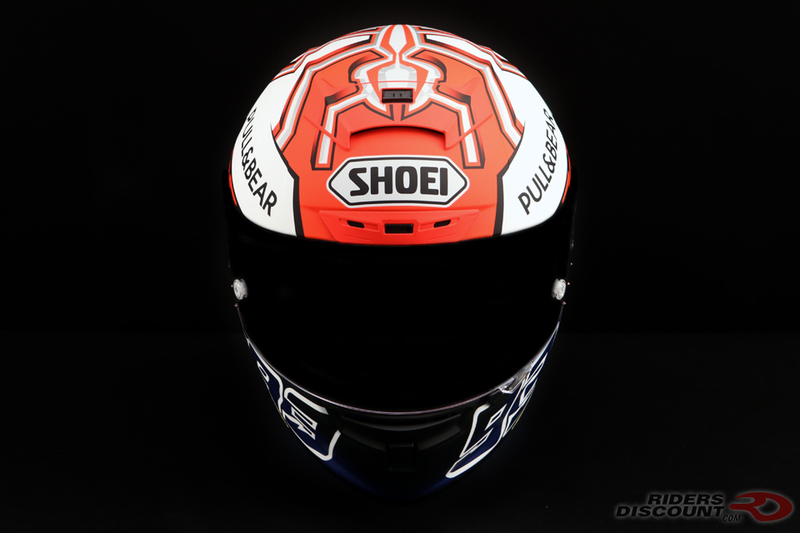 The side air outlets of the helmet have been re-positioned to better allow hot, moist air to leave the helmet. Overall, the X-Fourteen has six air intakes and six exhaust outlets. A few changes have been made to the face shield and shield locking mechanism. First, the CWR-F Race Shield (equipped with Pinlock EVO fog-resistant system) has innovative new ribs on the edges to help eliminate bending. The X-Fourteen now has a double shield locking mechanism, designed to prevent unwanted shield openings while riding. The QR-E Base Plate System on this helmet not only makes changing shields easy but also blocks out unwanted water and wind when closed. The X-Fourteen’s 6-layer AIM+ shell construction and multi-layer EPS work together to redirect impact energy in the case of a crash. An Emergency Quick Release System (E.Q.R.S.) 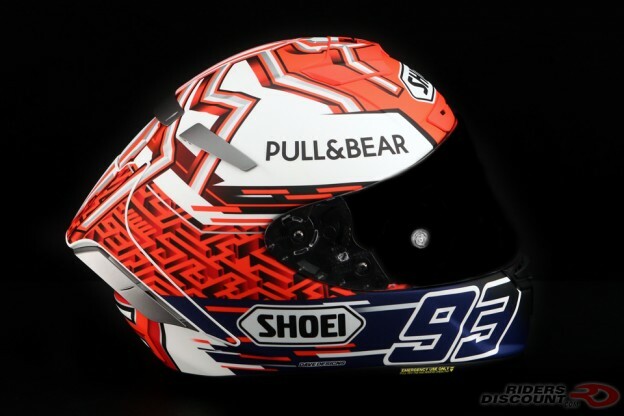 is built into the helmet to allow medical personnel to safely remove the cheek pads and helmet from an injured rider’s head. The 3D Max-Dry Interior is customizable with optional sizes for each section of the center pad. Made of Max-Dry material, the inside “absorbs and dissipates sweat twice as fast as tradition nylon.” The interior is completely removable, washable, replaceable and adjustable. 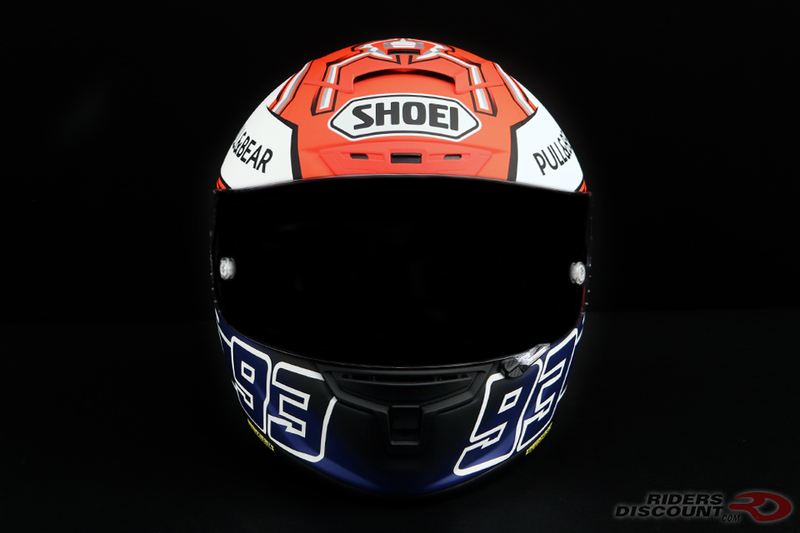 To learn more about this helmet and the entire Shoei X-Series, visit our Ultimate Guide to the Shoei X-Series.